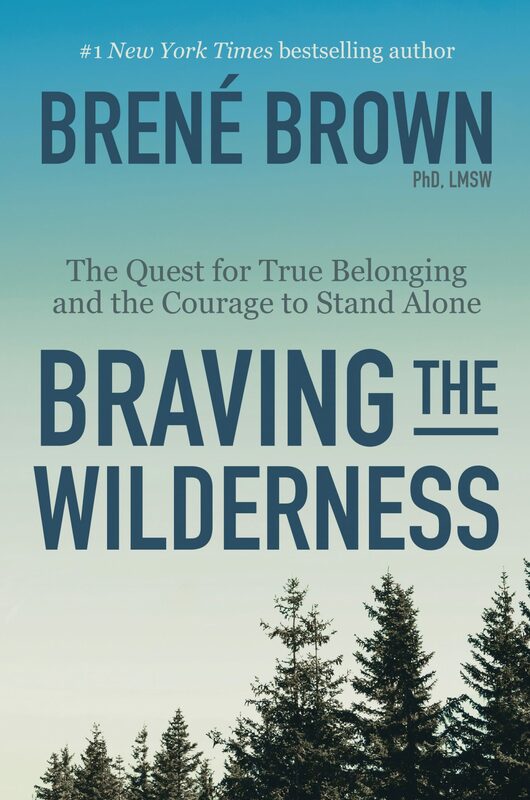 In a Western, American age where obsession with self reigns, Brené Brown’s latest book, Braving the Wilderness: The Quest for True Belonging and the Courage to Stand Alone, is apt to find broad reception. Random House (2017). 208. $28.00. Social scientist Brené Brown has sparked a global conversation about the experiences that bring meaning to our lives—courage, vulnerability, love, belonging, shame, and empathy. In Braving the Wilderness, Brown redefines what it means to truly belong in an age of increased polarization. With her trademark mix of research, storytelling, and honesty, Brown aims to change the cultural conversation with her map to true belonging. Brown’s religion is a religion of the autonomous self, which she believes—if rightly practiced—will naturally result in an ethic of respect for others. She suggests that by turning inward, going deeper into ourselves—which she calls our “wilderness”—we will be able to belong to our true selves and thereby belong to others with whom we share in the divine (115). In his 1979 bestseller, The Culture of Narcissism, cultural historian Christopher Lasch diagnosed post-1960s American society with something similar to the clinical diagnosis of narcissistic personality disorder or “pathological narcissism.” This excessive self-love plagues not just the society as a whole but individual lives as well, Lasch argued. It’s within this milieu that New Age was birthed. As Brown works out what it means to belong to oneself, she unveils an ideology of the divine self—an elixir of New Age thought, Eastern mysticism, and pop psychology. Brown’s book fits in this rubric of incurvatus in se—a phrase Martin Luther borrowed from Augustine—which means “twisted back into one’s self” or “curved in on itself.” Luther writes, “Scripture describes man as so curved in upon himself that he uses not only physical but even spiritual goods for his own purposes and in all things seeks only himself” (345). Brown touches on a longing we share as humans, one perhaps more pronounced in an individualistic society like the United States: belonging. We desire to belong to something or someone. Yes, God made us for community and belonging. It was not good for man to be alone in Genesis 2, so he created a female partner and companion. God himself is not a lonely God. There is community even in the Godhead as he is three persons in one. Brown touches on a longing we share as humans, one perhaps more pronounced in an individualistic society like the United States: belonging. But Brown’s answer for belonging falls short and runs antithetical to what we find in Scripture. True belonging doesn’t begin when we belong to ourselves. The opposite is true. In his letter to the church in Colossae, Paul writes that believers should be careful that no one takes them captive by any kind of teaching or belief system that is “not according to Christ” (Col. 2:8). Paul’s emphasis is different: “For in him the whole fullness of deity dwells bodily, and you have been filled in him, who is the head of all rule and authority” (Col. 2:9). Contrary to Brown, the Bible teaches that we aren’t divine; Jesus Christ is divine. We are sinful, messed-up beings with no hope outside the grace of God. The same God who told Moses, “I Am Who I Am,” is the same God we find fully in Jesus Christ. As theologian T. F. Torrance taught, there isn’t a different God behind the back of Jesus Christ. The gospel promises, therefore, that in Jesus Christ, in him, we belong to God. In him we find our true belonging—belonging that was once severed by our sin but is now possible because he canceled “the record of debt that stood against us” by “nailing it to the cross” (Col. 2:14). While I applaud and even agree with Brown on some of her ethics—not dehumanizing other people, treating them with respect, and so on—her ethics won’t be realized as long as they’re grounded on the theology of divine self. The more we belong to ourselves, curving inward, the less likely we are to lay down our lives for our neighbor. Brené Brown’s ethics won’t be realized so long as they’re grounded on the theology of divine self. Rather, the message of Scripture is that we were loved by God when we were unlovable—indeed, when we were his enemies (Rom. 5:10). Ever since Adam and Eve were exiled from Eden, God has been going out to bring us back in. His love isn’t ethereal or untouchable; it’s made concrete in the advent, death, and resurrection of his Son. Only as believing recipients of God’s love—as those who belong to him—are we able to love him and love others. So if we are to have any hope of embodying a love ethic in which we aren’t dehumanizing, disrespecting, or destroying others, it must begin with belonging to God, the true divine, and not ourselves. Kristen Padilla is the author of a new book, Now That I’m Called: A Guide for Women Discerning a Call to Ministry (Zondervan, 2018). Located in Birmingham, Alabama, she is a speaker, Bible teacher, wife, and mom, and she serves as the marketing and communications coordinator at Samford University’s Beeson Divinity School, where she earned an MDiv in 2008. Kristen also occasionally blogs at kristenrpadilla.com. Does ‘Turn the Other Cheek’ Mean ‘Get Walked All Over’?